Chrome have added better support for text-decoration, which is fantastic since we can finally enjoy looking at hyperlinks without having ascenders crashing into the underline! Not to mention the ability to change the colour, waviness, positioning, etc of the underline, independently of the text. 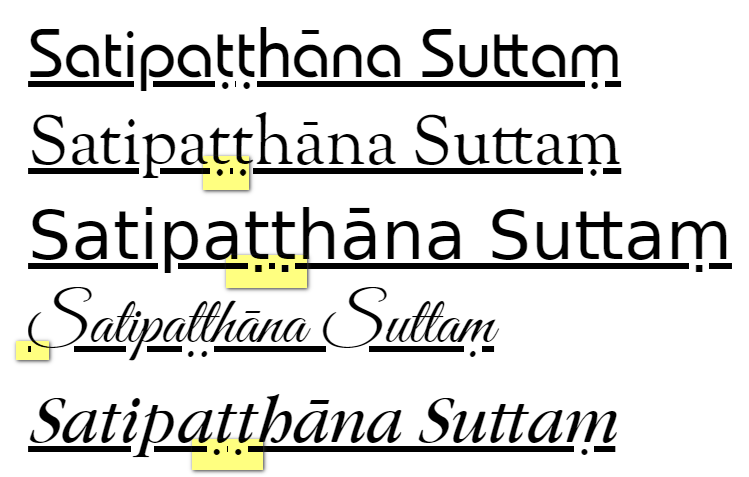 Well, all of the letters with dots underneath are coming from some other font, which seems to have pretty bad positioning of the underdots. What issue are you seeing with the ṃ? Thanks for pointing out that the misplacement of the dots was due to font substitution. The position is OK with web fonts. The other issue is the weight of the underlining and the short underline between letters with dots. The underline also precedes the S in the script font.